Currently 1378 in stock with more arriving soon. 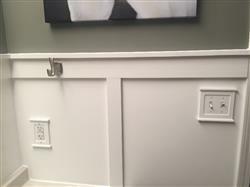 Item Dimensions: Height = 5 1/2" by Width = 3 1/2"
I really like the wall plates -- they match the cabinet in same room. Very good - nice quality product. Great price! Design was perfect and the white was a true white! Thank you!! I had 2 already I love them will be ordering more I ordered $ 75 dollar worth not one. I love the look of these wall plates. They are a little pricey but well worth it. Got them sooner than I thought with the quick shipping.